"Includes bittersweet, semi-sweet, and milk chocolate chips in the mix." "Rings in under $5 and customers say that it's delicious." "It will fool anyone into thinking it’s a standard brownie that includes flour." "The ingredients in this brownie mix are organic and non-GMO." "Produces a rich, fudgy brownie using the basic instructions." "Perfect for those that want a less intense chocolate taste." "You can also use this mix for making regular brownies." "Whole wheat adds a nutty flavor and a chewier texture that many users love." The rich chocolate texture and simple ingredients earn this brownie mix a top spot on our list. 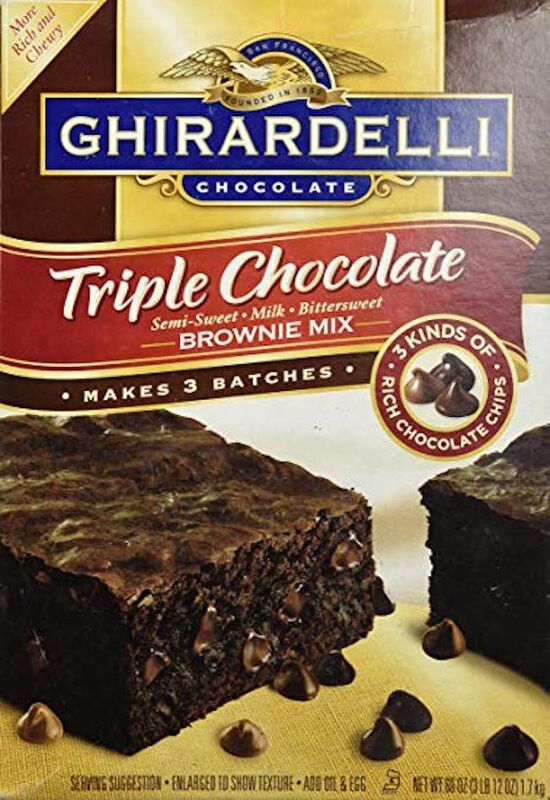 This mix is also a favorite among those who bake from scratch, and some even admit to using it as their backup brownie mix when they’re short on time and have a chocolate craving! This mix earns its triple-chocolate name by including bittersweet, semi-sweet, and milk chocolate chips in the mix, so each bite has a burst of chocolate flavor. Making these brownies is simple since you don’t even need to melt butter. It just requires water, oil, and eggs, which most people already have in their pantry and fridge. For a more fudgy texture, users recommend under-baking by about five minutes. This makes a 13 x 9-inch pan of brownies, so you’ll have plenty for a party or for snacking throughout the week. Three pouches are included in the box, so you can make three batches of brownies before you need to buy more. 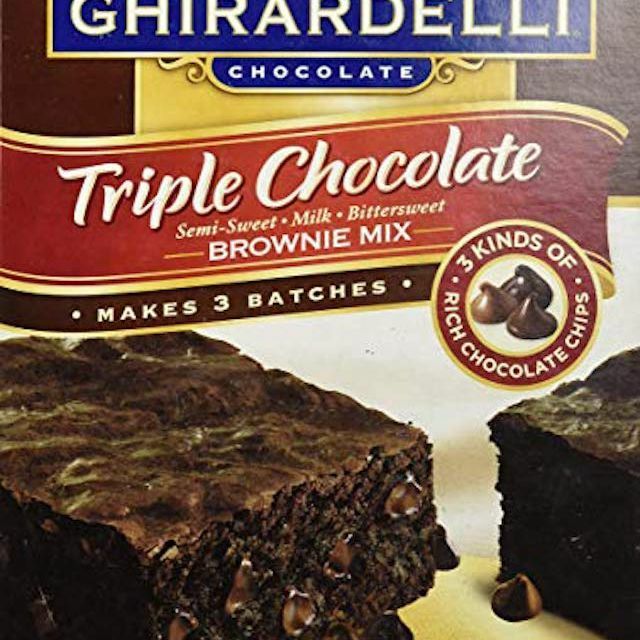 This top-rated brownie mix rings in under $5 (less than a cup of coffee), and customers say that it's both delicious and impossible to mess up! Similar to our best overall pick, this mix only requires a few ingredients. This mix is also very flexible with the pan size since it includes baking times and temperatures for three different sized pans, as well as an adjustment for proper baking in dark-surfaced pans. For a richer flavor substitute oil for butter and add pecans or walnuts for a bit of crunch. Don't have the right pan for baking? Check out our favorite baking pans available for purchase. This gluten-free brownie mix will fool anyone into thinking it’s a standard brownie mix that includes flour, so you can be sure that your non-gluten-free friends will love it as well. Another benefit is that the finished product stores well. While many gluten-free baked goods don’t fare well in storage, this mix can be stored longer so extras don't go to waste. However, make sure to always store leftovers in a glass storage container or another airtight container. The box suggests baking in either an 8-inch square pan or a 9-inch round pan and includes tips for baking in glass or dark metal pans. While the standard version is fudgy, it also includes instructions for making more cake-like brownies. You’ll need oil or melted butter, water, and eggs to make either recipe. You’ll get six packs of brownie mix in each box, so you’ll have plenty for parties and family gatherings. The Madhava company got its start as a family farm and honey producer and has grown over the years, adding more and more to their offerings. They pride themselves on creating products free of preservatives and overly processed sugars, so you can feel good about indulging in their mixes. The ingredients in this brownie mix are organic and non-GMO and include sustainable coconut sugar and ancient whole grains like Kamut wheat (which is higher in protein) and spelt. To make this mix you'll need water or milk, oil, and one egg, and can be made in an 8-inch square baking pan. Users have said that they’ve been able to use flax as an egg-replacer with this mix to make it vegan. Our favorite dark chocolate mix comes from Duncan Hines, a familiar and generations-old brand. This mix produces a rich, fudgy brownie that customers consistently call "the best brownies in the whole world." This mix requires egg, water, and oil for both brownie styles, and includes baking instructions for using three different sized baking pans, with adjustments for dark-colored pans as well. Buy a single box or a pack of four if you're baking for a crowd. The box also includes instructions for a more cake-like brownie, if you prefer that kind of texture and taste. If you don't want to mix your batter with a spatula, check out our favorite hand mixers. Not everyone loves the bitterness of dark chocolate, so this milk chocolate brownie mix is perfect for those that want a less intense chocolate flavor. It makes a 13 x 9-inch pan of brownies, but it includes instructions for thicker brownies using a 9-inch square pan or an 8-inch square pan. It also includes instructions for making a double batch of the mix in a 15 x 10-inch baking pan. This mix requires oil, water, and eggs, and includes instructions for making either fudgy or cake-like brownies. You can purchase a single box or a pack of three so you’ll have plenty for family events, parties, and midnight snacking. Looking for more chocolate treats to indulge in? Take a look at our selection of the best gourmet chocolates. Brownie cookies are a popular dessert that's easy to make, especially if you have a brownie mix to speed up the process. We love the Betty Crocker Fudge Brownie Mix because it has a rich taste and the texture is nice and moist. Of course, you can also use this mix for making regular brownies, using water, oil, and eggs for either fudgy or cake-like brownies. There are directions for baking this mix in different sized baking pans, so you can choose between thick or thin brownies. The family size box contains 18.3 ounces. Kodiak Cakes boasts whole grains and healthy ingredients, and while brownies might never be considered health food, these are certainly healthier than many mixes. While whole wheat can often change the texture of baked goods in a negative way, in brownies they add a nutty flavor and a chewier texture that many users love. You’ll need butter, oil, water, and eggs to make these brownies, and they bake in either a 9-inch square pan or an 8-inch square pan. Looking for more bakeware? Check out the best silicone baking pans available online.